The birth of my company started over 4 years ago with an idea- 4 paint brushes and busted piece of furniture. Later on it would be a dog, a chewed couch and my desire to conserve the environment that would truly launch me into a successful career. As a child I was always artistic and you could always catch me doing something creative. And that urge - that desire to make things with my hands - didn't fall short of my adult life. After making my way in the Commercial Real Estate Industry I made the decision that I wanted something more...I wanted to have FUN! I longed to start my own furniture RE-Creation company. where I'd take someone's current furniture and turn it into a work of art. So, I left my desk that day and set out to work on furniture. I started small, by going to yard sales, and buying old furniture- things that were "no good" to someone else, always proved to be PERFECT for me. I began taking this furniture and making it new again and I coupled it with my desire to conserve all resources. I began to pay attention to those appliances which are thrown out daily but still have life in them. I turned my attention to furniture that has 18 years of life in its past. Realizing that as a recreation each of those 18-year-old pieces of furniture could have 18 more years and look even cooler than it did before. I wrote my business plan and managed to do everything required to keep my company afloat. 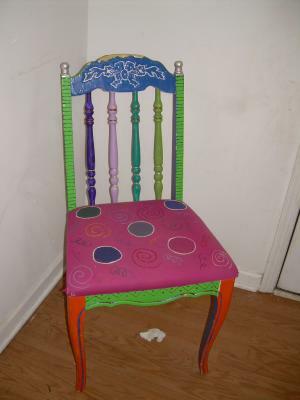 Getting furniture, old fabric, and paints off craigslist, and turning a profit on free items. I now purchase items and turn them in to art...and the profit is in my small signature on the back of each piece. You can buy a fridge anywhere...but you can't get one with a mural across it. "Starting your own business isn't hard as long as you have proper planning and proper goals."